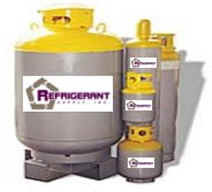 Refrigerant Supply Inc. - We buy and sell refrigerants (freon). After our link is on your site, email us at links@refrigerant-supply.com with a link to the page with our link and we will add your link within 24 hours. Please be sure to place "refrigerant link" in the subject line or your email. If you have a refrigerant related site and have advertising opportunities on your site, please let us know.